Are you a nonprofit organization? Have you already chosen grants to apply for on GrantWatch.com? "Few people realize how large charities have become, how many vital services they provide, and how much funding flows through them each year. Without charities and non-profits, America would simply not be able to operate. Their operations are so big that during 2014, total giving was more than $358 billion." You could be looking for a grant for children in your school, from nutrition to health programs or scientific advancements. No matter what field of grants you are searching, there is a suitable grant for you at GrantWatch.com. With a grant writer from GrantWriterTeam.com, you will get the results you need to fund your organization. If your organization’s mission and vision statements could use a revamp, a grant writer will be more than happy to help you find the right words for your needs. They can help publicize your work through local media outlets like TV stations and newspapers. To learn more about what a grant writer can do for you, check out the article, 8 Reasons to Hire a Grant Writer. How novel is the proposal? If not novel, to what extent does the potential impact overcome this lack? Is the research likely to produce new data and concepts? Are the procedures appropriate, adequate, and feasible? Have they shown competence, credentials, and experience? Are the facilities adequate and the environment conducive? Not only will grant writers help you apply to the grants you’ve chosen, but they will also help you search for additional grants. To request a grant writer, go to GrantWriterTeam.com and click Request a Writer. There is a $50 administrative fee, after which you will receive bids on your project. You may choose from one of the bidding writers, and that writer will contact you promptly. Together, you will work out deliverables, such as drafts of the proposal and the final application. You will have to pay a small retainer, but this is negotiated with the grant writer. Fill out a request for a grant writer today! You can be well on your way to attaining your funding goals soon! 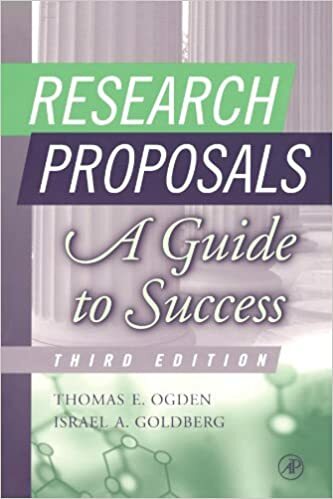 And if that’s not enough information for you, check out the following book: Research Proposals: A Guide to Success by Thomas E. Ogden and Israel A. Goldberg. In this book, you will gain insight into the reviewer’s perspective. You will also find tips to enhance proposals and recent changes in NIH policies. It also contains excerpts from actual grant proposals! What Grant Writers Can Learn – or Not Learn – from the Presidential Candidates! This may surprise you, but grant writers have a lot in common with the Presidential candidates. Like candidates who are competing with each other to get elected, grant writers face stiff competition to get proposals funded in tough economic times. And like the Presidential candidates seeking your votes through compelling speeches and interviews, grant writers are introducing themselves and their organizations to grant makers through compelling written proposals. But unfortunately the actual writing of the grant proposal too often gets short shrift—and I’m not just talking about grammar, punctuation, and spelling, which should be perfect every time. Presidential candidates have to make speeches and conduct interviews when they’re exhausted and overwhelmed. And sometimes they make glaring errors and have to apologize. Grant writers have the same problem—they must meet fixed deadlines even if they are exhausted and overwhelmed. But once the grant is submitted….that’s it. I have a couple of suggestions that might help grant writers (and also Presidential candidates—but it’s not my place!) to increase their chances for success. Choose your words carefully when writing your proposal. Being politically correct does not simply mean avoiding obvious slurs and insults; it is also important to be up-to-date and appropriate with your choice of words. For instance, “children who are retarded” is no longer the acceptable way to discuss children with “intellectual disabilities”. Using sensitive language is not only the right thing to do, it is also the smart thing to do. It is impossible to know who is reading your proposal and what thoughtless word or phrase might offend that person. And, while you’re choosing your words carefully, stay away from slang, abbreviations, and acronyms. Some grant makers may not mind casual language in a proposal—but, to be on the safe side, it’s a good idea to edit out informal words and phrases like “chill out”, “dude”, “cop”, and “kid” before you submit your final draft. And although Presidential candidates do it, grant writers should never exaggerate, go overboard with adjectives, or make grandiose promises they cannot keep in grant proposals. The program you are proposing is probably not the best and the greatest and the most hugely innovative in the world! It will probably not change the course of history and make the planet a better place! Let your organization’s accomplishments stand on its own merits. Instead of saying it is “known the world over for its fantastic work,” explain in detail why your organization is highly regarded and flourishing and the program you’re seeking funding for is excellent. Data, statistics, testimonials, and facts will convey to funders much more essential information about your organization and program than flowery language and vague, empty promises. Good luck! I hope you win. I mean I hope your grant proposal gets funded (which is a huge win). If you need a grant writer, remember to request one at GrantWriterTeam.com. Or, if you are a grant writer, join GrantWriterTeam.com and bid on available projects! About the Author: Ellen Karsh is the co-author, with Arlen Sue Fox, of The Only Grant-Writing Book You'll Ever Need (Basic Books: Fourth Edition, 2014). She was the director of the NYC Mayor's Office of Grants Administration for eight years, working for Mayors Giuliani and Bloomberg, and prior to that she developed and wrote grants for the NYC Department of Education. Many organizations learn a great deal about their own goals during the process of applying for grants. Many discover shortcomings in eligibility requirements, and many more discover insight toward setting practical goals for their campaigns. This does not have to be the case, however. To successfully apply for grants, an organization should set out to clearly define their goals, campaign, and strategies for accomplishing their target. With the proper research and reflection, any nonprofit can successfully apply to grants year-round. Let's take a look at 3 essential tips that professional grant writers use to apply for grants, and how you may use them for your nonprofit! What does this organization intend to accomplish? How is this organization different from others in the field? Who does this organization represent? 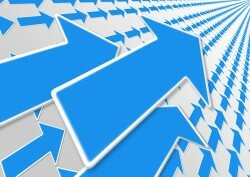 When do you expect results from your organization? Where will your organization make the most impact? Answering these questions will help you explain your mission succinctly and powerfully. By understanding your group’s core principles, you will have a solid foundation on which to promote your mission. Understanding each and every aspect of your organization will allow you to align your group with donors that accord with your mission and its ideals. It is important to research every potential donor, as each donor, no matter how similar, will have slightly differing values. Donor research will save your organization a lot of time because you will already know which ones are worth the application process. This research further equips you for your grant application because you will be prepared to answer the questions with your donor's expected results in mind. Knowing your donor ingratiates your organization simply by demonstrating due diligence to like-minded, philanthropic efforts. You know what your organization stands for, and you know what your potential donors support; but, how are you going to make a practical change in your field of philanthropy? Knowing your goals involves precise planning. Know your numbers! The more you can quantify your campaign with objective numbers, the more realistic your campaign will appear to donors. Do not use vague language, guessing, or improvised numbers. Present your goals with transparent honesty and well thought-out plans. Do not make your potential donors guess if your funding target is too much or not enough; or, how exactly the money will be distributed for each step of the campaign. Premeditate your campaign goals to the penny! Imagine you are the donor, and ask yourself every question as to how to make your campaign successful. If you can answer every question with proper explanations, then your goals are ready for proposal! You know what you need to express in your grant applications. 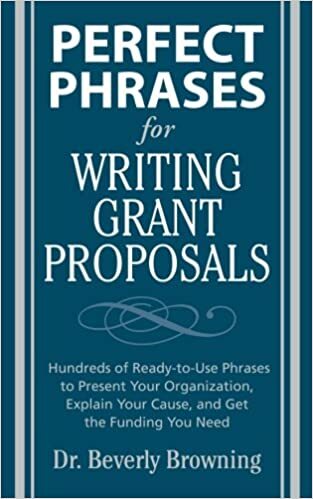 With this book, Perfect Phrases for Writing Grant Proposals, by Dr. Beverly Browning, you can learn how to express these topics. Dr. Browning demonstrates how to introduce your organization and its accreditations; how to describe your campaign and its goals; and, much more! Use the right phrases when you apply for a grant–the key words donors are looking for! Now that you are ready to apply for grants, how do you find them? Go to GrantWatch.com and search for thousands of grants from over 50 categories. This directory makes finding grants a fast and simple process. Once you have found a grant that suits your nonprofit's eligibility requirements (all details given at GrantWatch.com), you may begin the application process! To ensure your application is fulfilled to the highest degree, it is strongly recommended that your nonprofit hire a professional grant writer for your second or third grant. The first grant should be your trial where you gather all the information needed for an application. Visit GrantWriterTeam.com to place a request for a grant writer, and you will receive bids immediately! Make the grant application process easy, and fund your campaign now. Call our grant experts for assistance today at 561-249-4129! About the Author: The author is a contributor to online nonprofit publications.